Details Cassel earth is a pigment of a deep semi-transparent brown color, supposed to be the color used by Rubens and Anthony Van Dyke in their paintings. Rublev Colours Cassel Earth is imported from Germany. Cassel earth, also known as Vandyke brown and Cologne earth, is a brown earth containing iron and manganese oxides and lignites, which are organic substances from peat or coal. It was first used in European painting in the 17th century and is still in use today. This color is found in the pictures of the old masters, among them Rubens, who used it mixed with gold ochre as a warm, transparent brown, which held up particularly well in resin varnish. 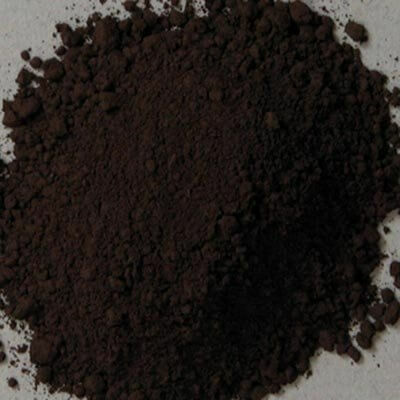 A brown earthy substance found in peat and lignite beds and used as a pigment; originally found near Cassel, Germany. Cologne brown or Cologne earth is a similar substance originally found near Cologne, Germany. The brown earth has since been obtained from various localities each of which may differ slightly in color and composition. To add to this confusion some pigments labeled Cassel earth or Vandyke brown are bituminous earths while others are artificial pigments made from carbon black and iron oxide mixtures. When natural Cassel earth is ignited, the pigment leaves a soft gray residue. It is not soluble in petroleum solvents like bitumen. 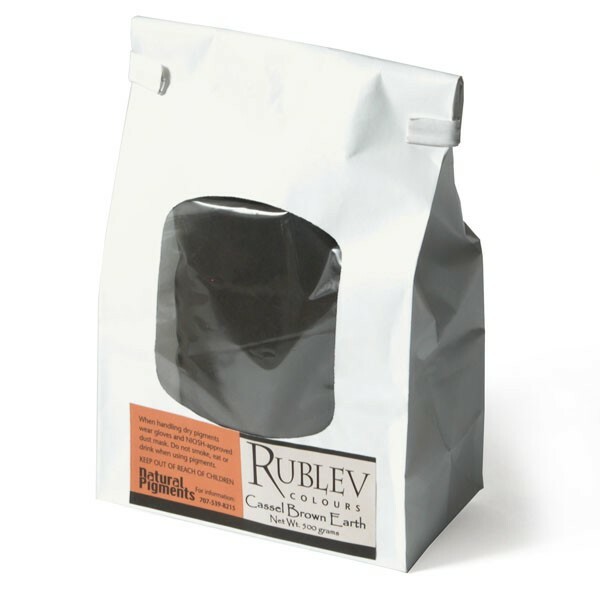 Rublev Colours Cassel Earth is a natural mineral imported from Germany composed of pyrolusite (a manganese oxide mineral), goethite (an iron hydroxide mineral) and lignite. Lignite, also known as brown coal, is brownish-black, heterogeneous mixture of compounds that has a high inherent moisture and high ash content compared with bituminous coal. The minerals composing Cassel earth, pyrolusite and goethite, are both considered to be among the most permanent pigments on the artist's palette. However, the lignite portion of Cassel earth has limited lightfastness, chemical resistance and heat stability. Cassel earth (the lignite portion) is partially soluble in oil and may exhibit a slight tendency to turn gray (most apparent when mixed with whites). When used in an oil paint layer coated with spirit varnish or mixed with resin varnish it is more permanent than when used in oil alone. It is sensitive to alkalis and becomes a cold gray in fresco. It can be used in oil, egg tempera and watercolor but should not be used in fresco and casein tempera painting techniques. There are no known incompatible pigments. Cassel earth absorbs a moderate to large amount of oil, is a medium to slow dryer in oil paint and forms a good film. The oil absorption ratio is 60-70 parts by weight of linseed oil to 100 parts by weight of pigment. If the measurement were grams, Cassel earth would require 60-70 grams of linseed oil to grind 100 grams of pigment to form a stiff paste. The pigment absorbs the oil with difficulty, so it is best to let the oil and pigment remain in contact overnight before grinding with a muller. The mixture before grinding may be quite thin, but after grinding, it will stiffen to a jelly-like consistency, which is the nearest state to a paste possible with this pigment. The finished paint may subsequently soften and become more fluid. Using boiled oils do not remedy this situation. From 25 to 50% on the weight of pigment of terra alba may be added to improve the physical characteristics of Cassel earth. Cassel earth is not considered toxic, however one of its components, manganese oxide, is moderately toxic and care should be used in handling the dry powder pigment so as not to inhale the dust.